Restoring the iPhone with iTunes has helped to fix almost all kinds of problems. Thus iTunes is always the first choice for iPhone users when their device gets stuck, slows down after upgrading to iOS 11 or iOS 12. However, iTunes is not a technical panacea, as a complicated program, iTunes restore errors also happens a lot, such as “iTunes cannot restore not enough free space”, “iTunes cannot restore because the backup was corrupt or not compatible”, etc. Fortunately, solutions are available to address these problems. Keep reading to get to know common iTunes restore errors and its fix. The reason for the occurrence of the message is because of the absence of the needed space on the device. 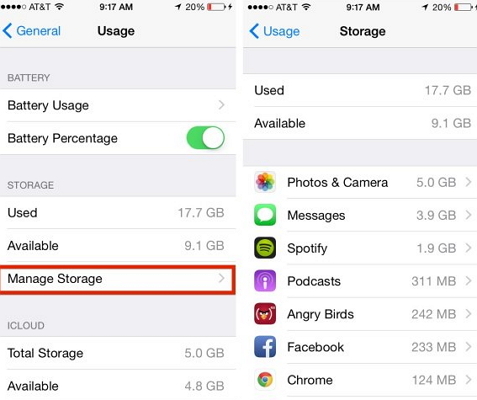 Go to Settings > General > Usage to check how much usage is available. ?If there is not enough space, free some of the content before creating a backup. You will see this message of “iTunes could not restore the iPhone because the backup was corrupt or not compatible the iPhone that is being restored” when the backup available on the Mac or PC is corrupt or incompatible with the device that you are trying to restore. There might be something wrong when you make a backup with iTunes. You’d better delete the backup and try again. Check the internet connection, as the restoration is a lengthy process and ensure that all the cables are intact. Apple’s servers go down from time to time. Ensure that you are not restoring the device during such period. If the firmware is different, iTunes fails to detect the same and complete the restoration process. Let iTunes download it automatically. Apple is preventing from signing a few firmware to stop jailbreaking and close security loop holes. If you are using such a firmware, then iTunes will pop-up with the message that there is an error. 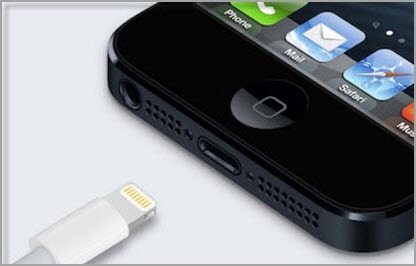 Replacing the existing USB cable with Apple certified USB cable will let you know about the problem. Keep away from cheap cables. You can check the process by inputting the cable into a different USB port. A few ports of the system contain lower power and speeds. Try changing to others and check whether iTunes is allowing the completion of the process. Use a different Mac or PC to check for the errors. You can also check for any breakages of the cable. If there are any, you can replace them and perform the task. Avoid keyboard and USB hubs, and make a direct contact between the device the Mac or PC. 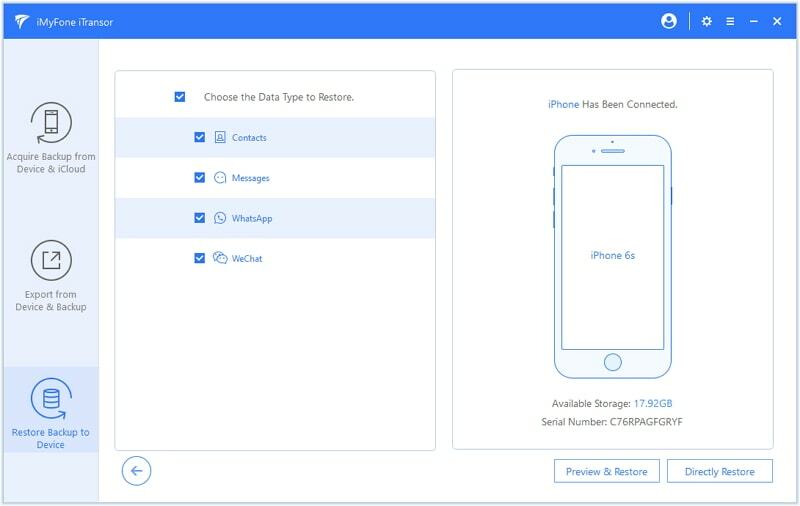 Flexible backup and restore only Contacts, Messages, WhatsApp data and WeChat data without erasing all settings and content. 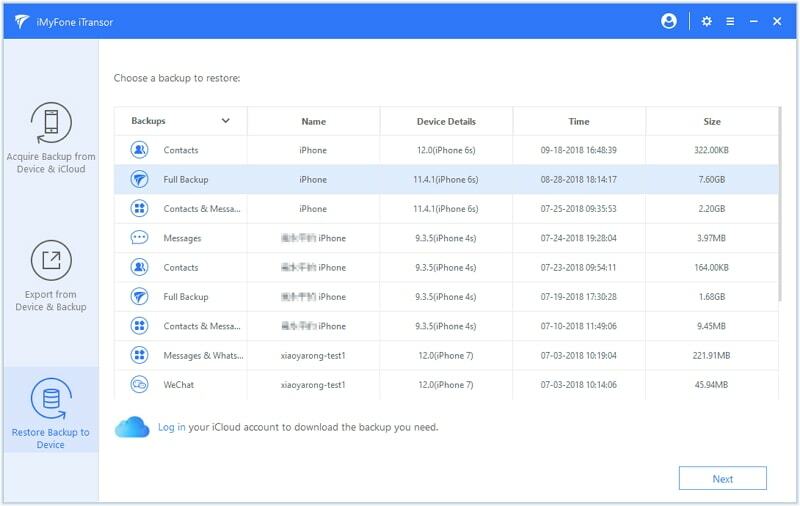 It helps in restoring your iPhone/iPad/iPod touch from different backup files, such as iTunes/iCloud/iTransor backup. It can extract 18+ types of data from the device or backup files to computer. It is completely compatible with iPhone 8, iPhone X running iOS 9, iOS 10, iOS 11, iOS 12 version. iMyFone iTransor provides you two options – Restore a full backup or only partial backup. Choose the one that suits you most. Step 1: From the “Restore Backup to Device” tab, choose an iTunes backup file to proceed. Step 2. 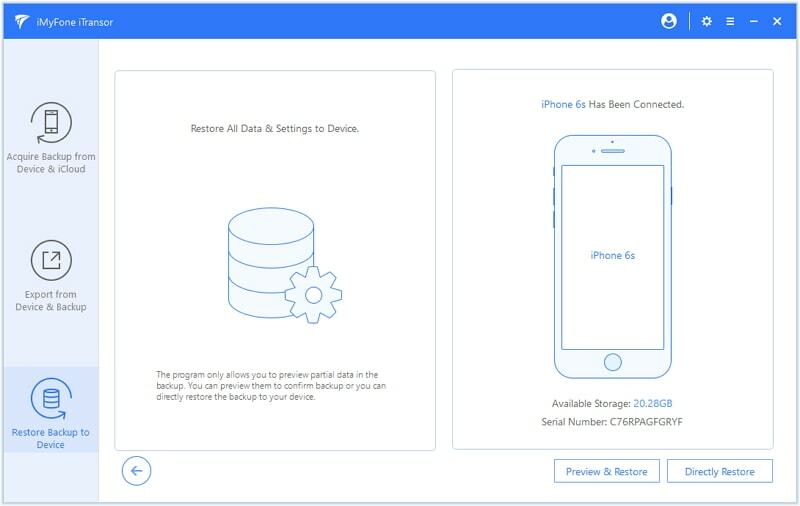 Choose the data types you want to restore from the iTunes backup and connect your iPhone to the computer. Step 3. Choose "Preview & Restore" or "Directly Restore" to start the restore process. 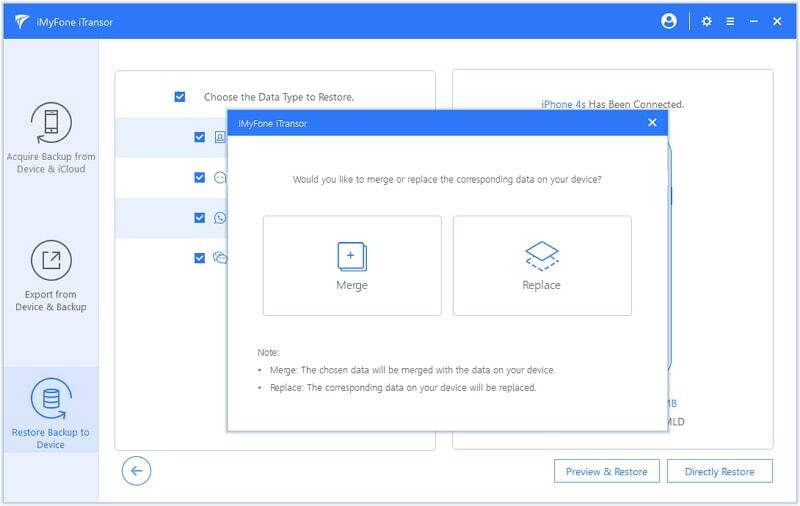 iTransor also allows you to choose merge data in your backup and device. 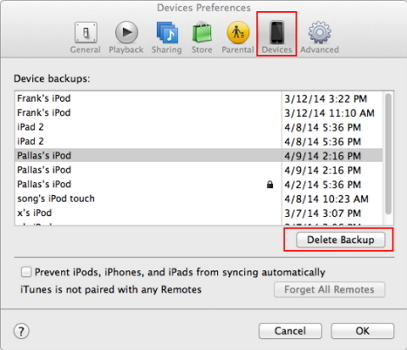 Step 1: From the“Restore Backup to Device” tab, choose an iTunes backup file to get started. 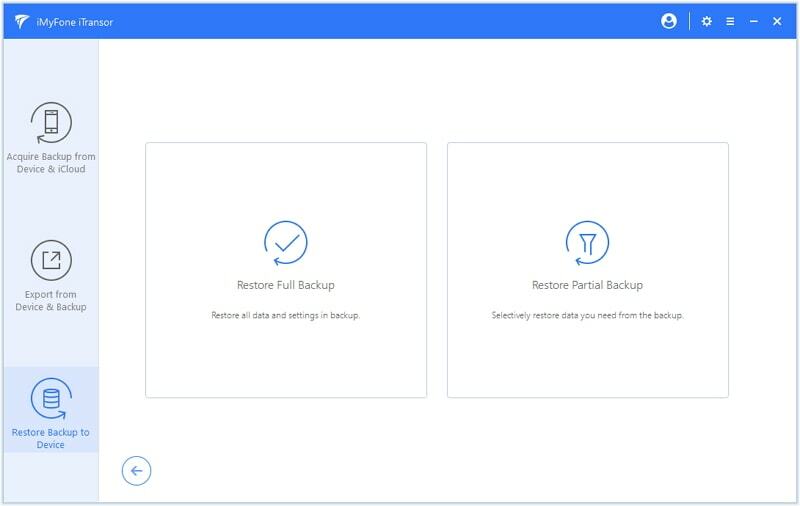 Choose "Restore Full Backup" from the next screen. 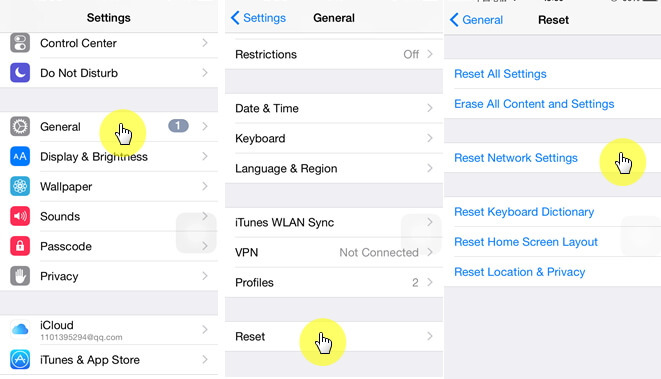 Step 2: Connect your iPhone to computer and click the "Restore" button to move on. Step 3. Wait for the process to complete. Please don’t disconnect your device during the restoring process. 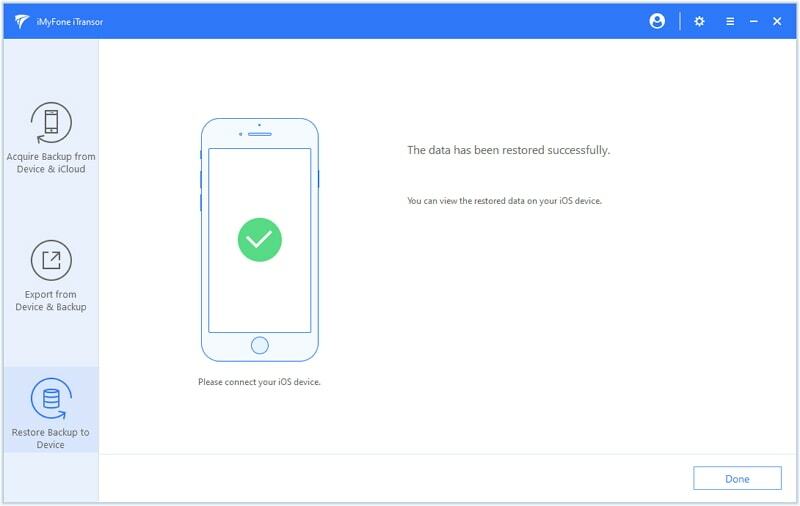 After the process, you can check the restored data on your device.